Not to be confused with Transactinide element. 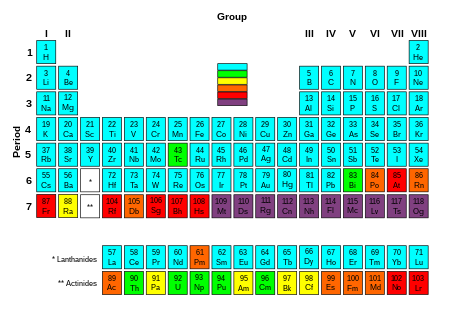 Of the elements with atomic numbers 1 to 92, most can be found in nature, having stable (such as hydrogen), or very long half-life (such as uranium) isotopes, or are created as common products of the decay of uranium and thorium (such as radon). The exceptions are elements 43, 61, 85, and 87; all four occur in nature, but only in very minor branches of the uranium and thorium decay chains, and thus all save element 87 were first discovered by synthesis in the laboratory rather than in nature (and even element 87 was discovered from purified samples of its parent, not directly from nature). All of the elements with higher atomic numbers have been first discovered in the laboratory, with neptunium and plutonium later also discovered in nature. They are all radioactive, with a half-life much shorter than the age of the Earth, so any primordial atoms of these elements, if they ever were present at the Earth's formation, have long since decayed. Trace amounts of neptunium and plutonium form in some uranium-rich rock, and small amounts are produced during atmospheric tests of nuclear weapons. These two elements are generated from neutron capture in uranium ore with subsequent beta decays (e.g. 238U + n → 239U → 239Np → 239Pu). Transuranic elements can be artificially generated synthetic elements, via nuclear reactors or particle accelerators. The half lives of these elements show a general trend of decreasing as atomic numbers increase. There are exceptions, however, including several isotopes of curium and dubnium. Further anomalous elements in this series have been predicted by Glenn T. Seaborg, and are categorised as the "island of stability". Heavy transuranic elements are difficult and expensive to produce, and their prices increase rapidly with atomic number. As of 2008, the cost of weapons-grade plutonium was around $4,000/gram, and californium exceeded $60,000,000/gram. Einsteinium is the heaviest transuranic element that has ever been produced in macroscopic quantities. Transuranic elements that have not been discovered, or have been discovered but are not yet officially named, use IUPAC's systematic element names. The naming of transuranic elements may be a source of controversy. So far, essentially all the transuranium elements have been discovered at four laboratories: Lawrence Berkeley National Laboratory in the United States (elements 93–101, 106, and joint credit for 103–105), the Joint Institute for Nuclear Research in Russia (elements 102 and 114–118, and joint credit for 103–105), the GSI Helmholtz Centre for Heavy Ion Research in Germany (elements 107–112), and RIKEN in Japan (element 113). 93. neptunium, Np, named after the planet Neptune, as it follows uranium and Neptune follows Uranus in the planetary sequence (1940). 94. plutonium, Pu, named after the dwarf planet Pluto, following the same naming rule as it follows neptunium and Pluto follows Neptune in the pre-2006 planetary sequence (1940). 95. americium, Am, named because it is an analog to europium, and so was named after the continent where it was first produced (1944). 96. curium, Cm, named after Pierre and Marie Curie, famous scientists who separated out the first radioactive elements (1944), as its lighter analog gadolinium was named after Johan Gadolin. 97. berkelium, Bk, named after the city of Berkeley, where the University of California, Berkeley is located (1949). 98. californium, Cf, named after the state of California, where the university is located (1950). 99. einsteinium, Es, named after the theoretical physicist Albert Einstein (1952). 100. fermium, Fm, named after Enrico Fermi, the physicist who produced the first controlled chain reaction (1952). 101. mendelevium, Md, named after the Russian chemist Dmitri Mendeleev, credited for being the primary creator of the periodic table of the chemical elements (1955). 102. nobelium, No, named after Alfred Nobel (1958). This discovery was also claimed by the JINR, which named it joliotium (Jl) after Frédéric Joliot-Curie. IUPAC concluded that the JINR had been the first to convincingly synthesise the element, but retained the name nobelium as deeply entrenched in the literature. 103. lawrencium, Lr, named after Ernest O. Lawrence, a physicist best known for development of the cyclotron, and the person for whom the Lawrence Livermore National Laboratory and the Lawrence Berkeley National Laboratory (which hosted the creation of these transuranium elements) are named (1961). This discovery was also claimed by the JINR, which proposed the name rutherfordium (Rf) after Ernest Rutherford. IUPAC concluded that credit should be shared, retaining the name lawrencium as entrenched in the literature. 104. rutherfordium, Rf, named after Ernest Rutherford, who was responsible for the concept of the atomic nucleus (1968). This discovery was also claimed by the Joint Institute for Nuclear Research (JINR) in Dubna, Russia (then the Soviet Union), led principally by Georgy Flyorov: they named the element kurchatovium (Ku), after Igor Kurchatov. IUPAC concluded that credit should be shared. 105. dubnium, Db, an element that is named after the city of Dubna, where the JINR is located. Originally named "hahnium" (Ha) in honor of Otto Hahn by the Berkeley group (1970) but renamed by the International Union of Pure and Applied Chemistry (1997). This discovery was also claimed by the JINR, which named it nielsbohrium (Ns) after Niels Bohr. IUPAC concluded that credit should be shared. 106. seaborgium, Sg, named after Glenn T. Seaborg. This name caused controversy because Seaborg was still alive, but eventually became accepted by international chemists (1974). This discovery was also claimed by the JINR. IUPAC concluded that the Berkeley team had been the first to convincingly synthesise the element. 107. bohrium, Bh, named after the Danish physicist Niels Bohr, important in the elucidation of the structure of the atom (1981). This discovery was also claimed by the JINR. IUPAC concluded that the GSI had been the first to convincingly synthesise the element. The GSI team had originally proposed nielsbohrium (Ns) to resolve the naming dispute on element 105, but this was changed by IUPAC as there was no precedent for using a scientist's first name in an element name. 108. hassium, Hs, named after the Latin form of the name of Hessen, the German Bundesland where this work was performed (1984). This discovery was also claimed by the JINR. IUPAC concluded that the GSI had been the first to convincingly synthesise the element, while acknowledging the pioneering work at the JINR. 109. meitnerium, Mt, named after Lise Meitner, an Austrian physicist who was one of the earliest scientists to study nuclear fission (1982). 110. darmstadtium, Ds, named after Darmstadt, Germany, the city in which this work was performed (1994). This discovery was also claimed by the JINR, which proposed the name becquerelium after Henri Becquerel, and by the LBNL, which proposed the name hahnium to resolve the dispute on element 105 (despite having protested the reusing of established names for different elements). IUPAC concluded that the GSI had been the first to convincingly synthesize the element. 111. roentgenium, Rg, named after Wilhelm Conrad Röntgen, discoverer of X-rays (1994). 112. copernicium, Cn, named after astronomer Nicolaus Copernicus (1996). 113. nihonium, Nh, named after Japan (Nihon in Japanese) where the element was discovered. (2004). This discovery was also claimed by the JINR. IUPAC concluded that RIKEN had been the first to convincingly synthesise the element. 114. flerovium, Fl, named after Soviet physicist Georgy Flyorov, founder of the JINR (2004). 116. livermorium, Lv, named after the Lawrence Livermore National Laboratory, a collaborator with JINR in the discovery, (2004). 118. oganesson, Og, named after Yuri Oganessian, who led the JINR team in its discovery of elements 114 to 118. Superheavy elements, (also known as superheavy atoms, commonly abbreviated SHE) usually refer to the transactinide elements beginning with rutherfordium (atomic number 104). They have only been made artificially, and currently serve no practical purpose because their short half-lives cause them to decay after a very short time, ranging from a few minutes to just a few milliseconds (except for dubnium, which has a half life of over a day), which also makes them extremely hard to study. Superheavy atoms have all been created since the latter half of the 20th century, and are continually being created during the 21st century as technology advances. They are created through the bombardment of elements in a particle accelerator. For example, the nuclear fusion of californium-249 and carbon-12 creates rutherfordium-261. These elements are created in quantities on the atomic scale and no method of mass creation has been found. Transuranium elements may be utilized to synthesize other super-heavy elements. Elements of the island of stability have potential important military applications, including the development of compact nuclear weapons. The potential every-day applications are vast; the element americium is utilized in devices like smoke detectors and spectrometers. ^ Considine, Glenn, ed. (2002). Van Nostrand's Scientific Encyclopedia (9th ed.). New York: Wiley Interscience. p. 738. ISBN 978-0-471-33230-5. ^ Morel, Andrew (2008). Elert, Glenn, ed. "Price of Plutonium". The Physics Factbook. Archived from the original on 20 October 2018. ^ Martin, Rodger C.; Kos, Steve E. (2001). Applications and Availability of Californium-252 Neutron Sources for Waste Characterization (Report). Archived (PDF) from the original on 17 December 2018. ^ Silva, Robert J. (2006). "Fermium, Mendelevium, Nobelium and Lawrencium". In Morss, Lester R.; Edelstein, Norman M.; Fuger, Jean. The Chemistry of the Actinide and Transactinide Elements (Third ed.). Dordrecht, The Netherlands: Springer Science+Business Media. ISBN 978-1-4020-3555-5. ^ a b Heenen, Paul-Henri; Nazarewicz, Witold (2002). "Quest for superheavy nuclei" (PDF). Europhysics News. 33 (1): 5–9. Bibcode:2002ENews..33....5H. doi:10.1051/epn:2002102. Archived (PDF) from the original on 20 July 2018. ^ Greenwood, Norman N. (1997). "Recent developments concerning the discovery of elements 100–111" (PDF). Pure and Applied Chemistry. 69 (1): 179–184. doi:10.1351/pac199769010179. Archived (PDF) from the original on 21 July 2018. ^ Lougheed, R. W.; et al. (1985). "Search for superheavy elements using 48Ca + 254Esg reaction". Physical Review C. 32 (5): 1760–1763. Bibcode:1985PhRvC..32.1760L. doi:10.1103/PhysRevC.32.1760. ^ Gsponer, André; Hurni, Jean-Pierre (1997). The Physical Principles of Thermonuclear Explosives, Intertial Confinement Fusion, and the Quest for Fourth Generation Nuclear Weapons (PDF). International Network of Engineers and Scientists Against Proliferation. pp. 110–115. ISBN 978-3-933071-02-6. Archived (PDF) from the original on 6 June 2018. Eric Scerri, A Very Short Introduction to the Periodic Table, Oxford University Press, Oxford, 2011. Annotated bibliography for the transuranic elements from the Alsos Digital Library for Nuclear Issues.